As you know, we have kicked off our 2018-19 annual donation campaign, Denali Gives! Our fundraising goal this year is to raise $200,000 to support all of the individual activities that you might normally donate to support, like the annual camping trips, spring study trips or 8th-grade promotion, as well classroom materials for our teachers, scholarships for extracurricular activities, and more. Your tax-deductible donation of $500 per student will enable us to meet our goal! If you haven’t made your donation, consider donating to Denali on Giving Tuesday (November 27, 2018). After two days of getting deals – Black Friday and Cyber Monday, #GivingTuesday is a day for giving back. Visit http://denali.summitps.org/donate to make your donation. Please contact Kevin Bock at kbock@summitps.org if you have any questions. On Saturday, December 12, 2018, we will have a facility work day at both campuses from 9am to noon. Tasks may include light repairs, patching paint, cleaning, and organizing. Students and parents are welcome. No experience necessary. 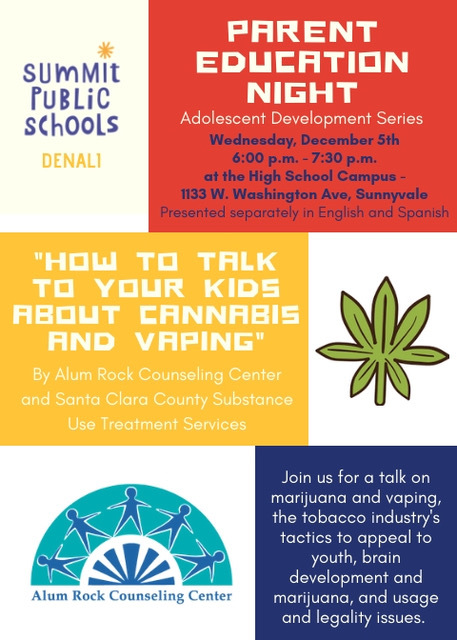 Please join us for a presentation on marijuana and vaping, the tobacco industry’s tactics to appeal to youth, the science behind brain development and marijuana, and usage and legality issues. We will offer two separate and concurrent sessions in English and Spanish. Presented by the Santa Clara County Substance Use Treatment Services’ contracted vendor, Alum Rock Counseling Center. Since our founding in 2013, Summit Denali has been in the process of “growing up” a grade each year through 12th grade to provide a high-quality public education to more Sunnyvale families. As you know, we have been working closely with local officials and the planning commission to gain the necessary permit and approvals to move forward with construction on the new, permanent high school facility. We are now approaching an important milestone in this work, and we are writing to ask for your support! Summit Denali will be appearing before the Sunnyvale Planning Commission at 7 p.m. on December 10. Mark your calendars! We need a strong showing of Denali supporters at this meeting. As founding members of Summit Denali, we rely on your efforts to build our community. Attend the planning commission meeting on 12/10 at 7pm, wearing Denali gear! Write a letter in support of Denali’s permit application! Volunteer to speak at the planning commission on December 10th. First Step: To help, sign up by filling out this form. Click here! After you take the first step, immediately after we return from Thanksgiving break, we will contact you with the materials and information you need to support Denali. We are still looking for a few parents (ideally 3 per grade level) to help with the high school spring study trips. The high school trips are scheduled for April 4-6 (April 5-6 for 9th grade). The high school trips are overnight (9th grade – 1 night, 10th and 11th grade – 2 nights). Ideally at least one of these parents could also attend the trip. We’re close to having enough to get started, but we need one or two more 10th grade parents to volunteer before we meet with teachers and staff to kick off the planning.